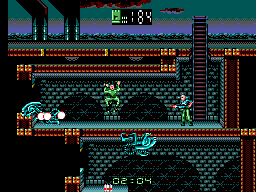 In this platformer you play as Ripley and try to rescue all the prisoners in the current level before the Time Limit Expires. I Do not know exactly how many levels are in this game,however they are all variations on one theme,basically a maze the player must travel through to rescue the prisoners which are scattered around on each level.Sounds simple? It isn't because Xenomorph's are also littered around the levels which you must deal with.Thankfully, you have a wide range of weapons at your disposal (Machine guns,Rocket launchers etc.) 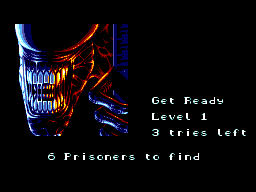 Also, there is a time limit on each level in which you must rescue all the prisoners and escape. The Graphics for this game are neat,trim and provide a Atmosphere to the game, but are average in quality. Also, all the sprites in the game are detailed enough to tell the difference between Ripley and her environment. The Title music and the in-game music are good as they match the theme of the game, on the other hand the sound effects are to few in number to enjoy as much as the music. You can use either a standard control-pad a control stick with this game. The Controls are Responsive and Simplistic, however selecting a weapon is a bit of a slow process and in that time the player can be hurt a fair bit. I Game ill be definitely playing again. The game provides a good atmosphere and a sense of urgency to the levels. However the repetitiveness of the levels can become boring. 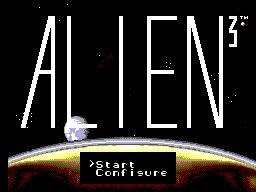 The game is let down by a lack of more ambient noise, but is still a enjoyable experience recommend the dame to fans of sci-fi fans or to the fans of the alien trilogy.